With focus on current trends and with our customers wishes in mind, we have chosen 15 standard window colours that represent the most popular colours in our production today. We keep tabs on current trends and choose colours suited for both contemporary new buildings and for renovation of old facades. Our standard colours are shown here. You can also choose to have a clear coat on all internal wooden parts. For the wood/aluminium elements, two colours may be chosen at no extra cost. Each colour is available in a Matt or Gloss Finish. Any non-standard RAL colour is available at nominal surcharge per order. 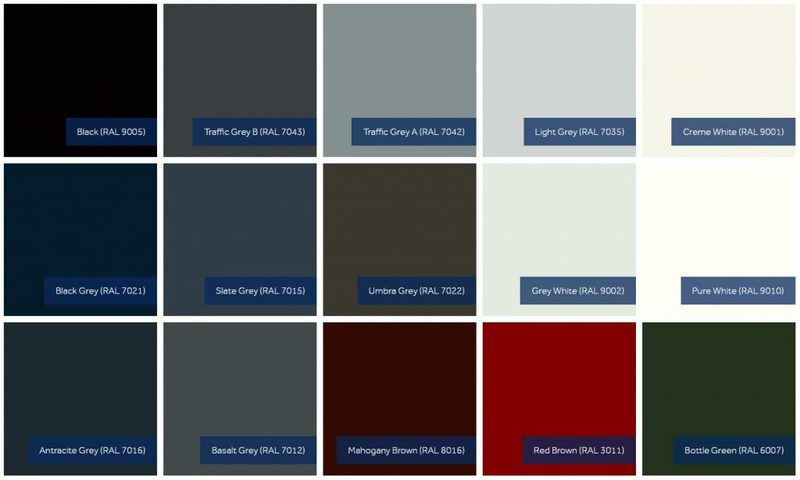 Please note that what you see here on your screen is an approximation of the original RAL colours and sable finishes and should not be used as a decision-making basis as slight differences in colour may occur. The final choice of colour and finish should always be made using an authorised RAL colour card or a surface sample.